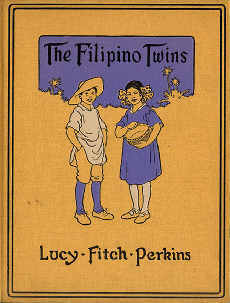 Sharing you a children's book now a collector's item The Filipino Twins by Lucy Fitch Perkins published i n1923. It is very well researched as if it had been written by someone who had visited the Philippines when the author has never been here! Like “It was a busy place,” she wrote about a dock along the Pasig River. “Men were unloading fish and vegetables from other boats…. Other men were piling the produce on carts drawn by carabaos and hurrying away to the markets. Scores of boats were tied along the banks, and in and out and up and down the waterway busy tugs plied back and forth, filling the air with the screams of their whistles and with smoke from their stacks…. There were also ships just sailing away loaded with sugar, tobacco, lumber, hemp, and coconuts.” Except that the family carabao is named Bobtail and the dog Dingo. The Filipino Twins is part of a series of 26 children's books (1910 - 1930) known as "The Twins Books" about the usual topic always attached to a Filipino setting - struggles of a family to overcome the poverty that threatens them. Most of the stories are twins (The Dutch Twins, The Japanese Twins, The Irish Twins etc) composed of one boy and one girl, the only exception is The Spanish Twins , which is about two boys. Each book took place in a different country or time in America's past. These books are now hard to find now hard to find You're lucky if you have one of these!